If you are a family member of a young adult who is in crisis this hotline number is for you. I have below defined what I believe a Critical Crisis can be in a young adults life and hopefully you can reach out for encouragement during these times in you life. A crisis is a turning point or decisive moment in events where you as a young adult or as a family member have met a crossroad. Typically, it is the moment from which an imminent critical trauma may go on to death or recovery. More loosely, it is a term meaning 'a testing time' or 'emergency event'. This crossroad is a crucial, decisive point or situation where a turning point, or an emotionally stressful event or traumatic change in a person's life will be taking place. A Critical situation you or a loved one is either in or verging on a state of crisis or emergency. The Young Adult Crisis Hotline offers immediate emotional support by telephone volunteers trained to help young adults who may be having relational problems, addictions, have an eating disorder, are suicidal, in emotional distress, or in need of reassurance. Services are free, confidential, and anonymous. Professionally trained volunteers handle incoming calls using active, caring, and nonjudgmental listening and problem-solving skills. All calls are free, confidential and anonymous. 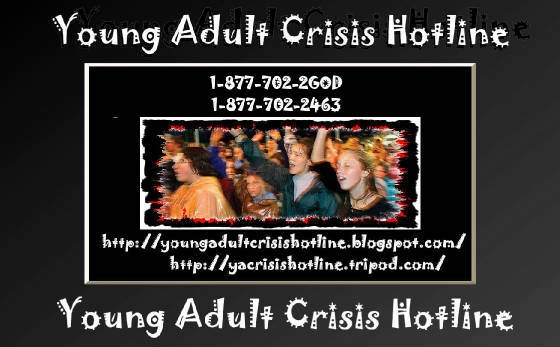 Young Adults in crisis... they're everywhere. Faced with physical and emotional abuse, drugs, peer pressure and the like, many today just don't have the resources or support to handle the pressure. The marketing experts at Hallmark say that "15 million Americans now attend weekly support groups for chemical addictions and other problems. Another 100 million relatives are cheering on their addicted loved ones. This means that half of all Americans are either in recovery or helping someone who is." We personally want to be able to reach out and help those who are in critical crisis with personal encouragement and care through the storm that faces your life personally. Please call us and let me try to help you right where you are at in your life. No matter how far, or how low you think you are it is not too late for help! Most of the time, we are just facing what we have personally chosen previously over and over again as a choice. Now we are facing a mountain and need help or a guide to help us through the dangerous path around the mountain passes. We just want to be that guide and be there for you if you want that guide, to survive the mountain passes. Please call, anytime day or night! 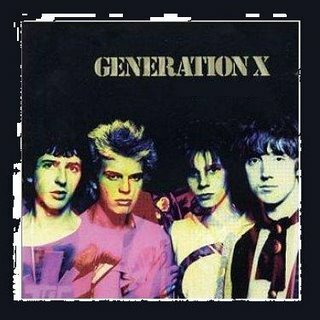 Generation X! Are you familiar with this phrase? It is highly probable that you have heard or read the phrase at least once. What does it bring to your mind? Does it provoke fear, confusion, despair, misunderstandings, or is it just another in a long line of such expressions used to label youth? Generation X has quickly entered our vocabulary as an easily recognizable moniker for the children of another definable generation: the "baby boomers." Thus this generation of teenagers also has come to be known as the "baby busters." "Xers" and "busters" normally don't elicit positive thoughts about our youth. Is this a legitimate response? Or are we maligning a significant portion of our population with such terms? Thus the concerns we have for our youth are concerns we have for ourselves. The "web of adolescence" touches all of us. As George Barna has stated, "taking the time to have a positive impact [on our youth] is more than just 'worth the effort'; it is a vital responsibility of every adult and a contribution to the future of our own existence." What About the Church and Busters? Let's survey a few other attributes of Generation X as we attempt to bring this group into sharper focus. These attributes should be especially important to those of us in the Christian community who desire to understand and relate to our youth. Because of "the loneliness and alienation of splintered family attachments" this generation's strongest desires are acceptance and belonging. (15) Our churches need to become accepting places first and expecting places second. That is, our youth need to sense that they are not first expected to conform or perform. Rather, they are to sense that the church is a place where they can first find acceptance. My years of ministry among youth have led me to the conclusion that one of the consistent shortcomings of our churches is the proverbial "generation gap" that stubbornly expects youth to dress a certain way, talk a certain way, socialize in a certain way, etc., without accepting them in Christ's way. Another important attribute of this generation is how they learn. "They determine truth in a different way: not rationally, but relationally. "(16) Closely aligned with this is the observation that "interaction is their primary way of learning. "(17) In order for the church to respond, it may be necessary to do a great deal of "retooling" on the way we teach. Lastly, busters are seeking purpose and meaning in life. Of course this search culminates in a relationship with the risen Jesus. It should be obvious that ultimately this is the most important contribution the church can offer. If we fail to respond to this, the greatest need of this generation or any other, surely we should repent and seek the Lord's guidance. Rule #1: Personal relationships count. Institutions don't. Rule #2: The process is more important than the product. Rule #3: Aggressively pursue diversity among people. Rule #4: Enjoying people and life opportunities is more important than productivity, profitability, or achievement. Rule #5: Change is good. Rule #6: The development of character is more crucial than achievement. Rule #7: You can't always count on your family to be there for you, but it is your best hope for emotional support. Rule #8: Each individual must assume responsibility for his or her own world. Rule #9: Whenever necessary, gain control and use it wisely. Rule #10: Don't waste time searching for absolutes. There are none. Rule #11: One person can make a difference in the world but not much. Rule #12: Life is hard and then we die; but because it's the only life we've got, we may as well endure it, enhance it, and enjoy it as best we can. Rule #13: Spiritual truth may take many forms. Rule #14: Express your rage. Now let's consider how parents and other adults might best respond to these rules. What Do They Hear From Us? · "Do as I say, not as I do." · "I'm the adult. I'm right." · "Because I said so, that's why." · "You want to be what?" · "This room's a pig sty." · "Can't you do anything right?" · "Where did you find him?" · "Do you mind if we talk about something else?" · "I'm kind of busy right now. Could you come back later?" Many people say there is a lot more conflict with parents when you're a teenager. Conflict is a normal part of any relationship, but sometimes this is more intense because of change. Let's face it, as we get older we change physically, emotionally and in the way we think about and see ourselves. Young people often move away from their parent's beliefs as they are learning about the world, and parents can find this hard. Be a consistent model. We can't just preach to them and expect them to follow our advice if we don't live what we say. Consistency is crucial in the eyes of a buster. Admit when you are wrong. Just because you are the adult and the one with authority doesn't mean you can use your position as a "cop out" for mistakes. Youth will understand sincere repentance and will be encouraged to respond in kind. Give honest answers to honest questions. Youth like to ask questions. We need to see this as a positive sign and respond honestly. Let teenagers develop a personal identity. Too often youth bare the brunt of their parents' expectations. In particular, parents will sometimes make the mistake of living through their children. Encourage them in their own legitimate endeavors. Major on the majors and minor on the minors. In my experience, adults will concentrate on things like appearance to the detriment of character. Our youth need to know that we know what is truly important. Communicate approval and acceptance. As we stated earlier in this essay, this generation is under too much stress. Let's make encouragement our goal, not discouragement. When possible, approve their friends. This one can be especially difficult for many of us. Be sure to take time to go beyond the surface and really know their friends. Give teens the right to fail. We can't protect them all their lives. Remind them that they can learn from mistakes. Discuss the uncomfortable. If they don't sense they can talk with you, they will seek someone else who may not share your convictions. Spend time with your teens. Do the kinds of things they like to do. Give them your concentration. They'll never forget it. This generation of youth, and all those to come, need parents and adults who demonstrate these qualities. When youth receive this kind of attention, our churches will benefit, our schools will benefit, our families will benefit, and our country will benefit. And, most importantly, I believe the Lord will be pleased. As you get older you change and grow in many ways. One of the ways is in how you think deeper and more abstract. Questions we ask as teenagers become than as a young child. It's a time when you start to think working out the world for yourself. Sometimes your values and beliefs can become different to your parents, leading to conflict. As you mature it becomes a more equal relationship where you all relate on the same level. This change doesn't happen overnight. The process of moving from one type of relationship to another can be a real struggle and your parents are still responsible for you for, maybe even after you might feel you should be responsible for yourself - so lots of talking about issues is needed. We all go through developmental stages. While you're going from being a baby, to a toddler, to a child, to teenager, to young adult - your parents are moving through their life cycle as well. They're going from a young adult, to an adult, to middle aged. And we're all having our individual "age related" crises along the way. Psychologists call it "developmental crises" and it's normal for us all to go through these. You've probably heard of "the mid-life crisis"? Parents may be going through their mid-life crisis while young people can be going through their "identity crisis". All at the same time - in one household. You grow and change so fast when you're a teenager, your parents can find it hard to keep up. It's a time when you want some independence. You want to think for yourself, to speak for yourself, to form your own values and opinions, to think about your life style and tastes, your emerging sexuality, to have some privacy, to be your own person. This is another one of those developmental crises - often the toughest to go through. It can be hard for parents to get used to these changes and the new emerging you. Apart from all the changes in thinking, emotions and identity, there are huge physical changes going on. Your body can change quite rapidly; it can be hard to cope with. Some people look mature and are treated like a man or woman before they really feel that way inside. Others are wondering why friends have changed before they have and when they'll catch up. It can all be overwhelming. To your parents, your physical growth can be a powerful message that you're about to go out into the world. They've probably learnt (often through making their own mistakes) that the world isn't always a wonderful place. Your parents are probably very much aware that young people can be at risk of getting into difficult and possibly dangerous situations. It can be quite scary for parents not knowing what's happening for you, not to mention imagining what could happen. Your parents may feel a need to guide you and protect you from harm. It can seem like parents are interfering. What they more likely want to do is keep you safe. This mismatch of understanding can end up in hassles and arguments. It takes a bit of give and take on both sides to work it out. Parents need to realize that young people need to learn about life for themselves. This is also a learning time for parents - learning when to step back and when to step in (so be patient with them). Sometimes we learn best by our own mistakes but at other times it's best to listen to other people's wisdom. If it's something that can affect your life for a long time to come, or if it will affect other people, then seriously consider asking your parents or a trusted adult for advice and information before making your decisions. If there are other big changes going on in your life, this creates more stress and conflict. Some examples of other major change are: moving to a new state or a different part of the state, family breakdown, or getting a new step-family. Try and talk openly with your parents about how this is feeling for you. Also try some relaxation strategies. When families move or migrate from one country to another the whole family faces massive changes. Apart from moving away from the familiar places, friends and family, there can also be huge differences in culture between two countries. Sometimes parents stick with the traditional ways, while younger members of the family begin to take on the traditions of the new country. This can mean a clash of cultures, values, ideas and ways of living life. 2. Jan Johnson, "Getting the Gospel to the Baby Busters," Moody Monthly (May 1995): 50. 6. Jay Kesler, Ten Mistakes Parents Make With Teenagers (And How to Avoid Them) (Brentwood, Tenn.: Wolgemuth & Hyatt, 1988). Most of this has been gathered information was from many sources and resources. I have attempted to give credit where credit is due.